Our trip to Red and White Mountain began June 18, 2011, and completed on August 19, 2012, with a cycle of seasons and a rotation of personnel in between. In 2011, we started with Greg Johnson, Joe Baker, Kathy Kohberger, Ted Lenzie, Frank Martin, Leigh Yi, and myself. In 2012, Greg and I returned to the mountain, with Noreen Ford and Rose Tomey. We started up at McGee Creek trailhead (8100), about ten miles south of Mammoth Lakes. 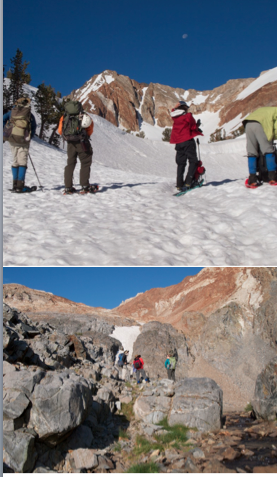 In 2011, we were in continuous snow cover by 9000 feet, but in 2012, we hiked on dry trail all the way to camp and saw only patchy snow in shaded gullies up high. 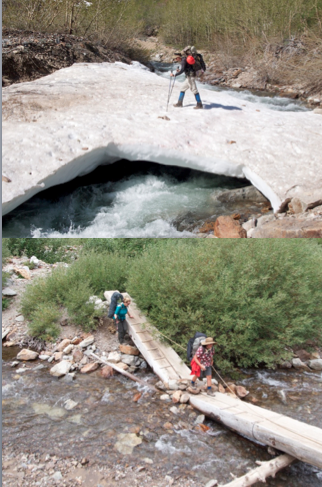 In 2011, we made our first crossing of the rushing creek on a fragile snow bridge, but in 2012, we saw that the place where the snow bridge had been before, a collapsed log bridge remained. As we advanced up the creek, we came upon a beaver lodge, home to a healthy family of aquatic tree gnawing rodents, thriving in both seasons. In 2011, we couldn't find the second creek crossing, and instead picked our way through avalanche debris, but in 2012, the second crossing was obvious and the trail crew had cleared a path through the rubble. We camped in view of Big McGee Lake (10800) both years, but in 2011 we found a rocky outcrop that was blown free of snow, far from the lake, and in 2012 we settled into four little bivy spots on steep slope right above the south shore. On both attempts, we climbed the easy face from Little McGee Lake to the northeast ridge, and followed that ridge toward the summit. In 2011, we stamped up deep but soft snow. I stepped onto a place where the snow wasn't supported by underlying rock, and fell into a moat deeper than I am tall. In 2012, we were on talus all the way. The class 2 ridge walk was strikingly similar on the two attempts, because in 2011, the windy ridge was blown free of snow, and in 2012, it was dry everywhere. 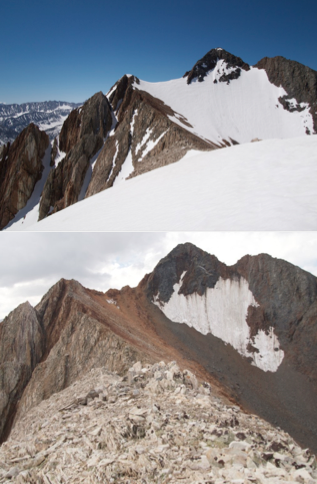 On the 2012 attempt, Rose was uncomfortable with the looseness of the scree and the exposure to a long slide, and chose to wait on the ridge while the others approached the peak. Both years, we reached the notch below the summit around noon. 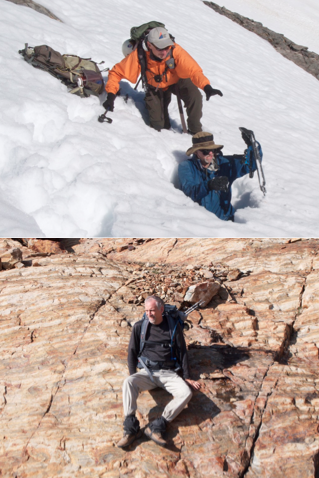 In 2011, we looked up at the steep snow, and admitting that we lacked the ice axes we needed to continue, turned away. In 2012, we clambered right up the rock, mostly class 2 with a few class 3 moves, and quickly attained the summit (12850). We found a summit register that consisted only of a single sheet of paper in a plastic mayonnaise jar. We added one more page. This register won't survive long unless somebody improves upon it. In 2011, the trip was scheduled in a two-day weekend. We returned to the lake, broke camp, hiked out to the cars, and drove home, arriving around 3:00 a.m. In 2012, we gave Red and White Mountain the extra day it deserves, and we only needed to make it back to camp on Saturday afternoon. But in 2012, we still had trouble with the return trip. Just as we started down from the ridge, the cloudy sky erupted in rain and hail. Water rushed over the slabs that were dry on our ascent, making our footing was unsure. Even though we all wore our foul weather gear, this much rain was too much, and our clothes got wet underneath. We were all damp and chilly when we returned to camp. I didn't realize until Sunday morning that Greg was on the edge of hypothermia. "I nearly went hypothermic. Something you don't want to do in the mountains. We got hailed and rained on coming down from Red and White Mountain. I thought it would be a short storm so I didn't stop to put on my waterproof pants. Note to self, stop and put on rain paints no matter what. Lesson learned. I didn't bring a pack cover because I carry a couple of garbage bags as a lighter alternative to the traditional nylon pack cover. The logic is to put everything in the pack in garbage bags to keep them dry instead of trying to keep them dry by keeping the pack dry. Who wants to stop and repack their backpack in the middle of a rainstorm? A pack cover can be quickly deployed. Lesson learned. My ultra light water resistant jacket is not waterproof so my undergarments got wet. Since there was a 20-30% chance of thunderstorms I should have brought the GORE-TEX jacket. Lesson learned. "By the time we got back to camp, I was soaked, and everything in my backpack, including my down jacket, was soaked. Maybe when there is a 20-30% chance of thundershowers I should bring fleece instead of or along with the down jacket. Lesson learned. My tarp-tent (http://www.tarptent.com/rainbow.html) had a small pool of water in the bottom by the time I got back to camp because I didn't stake it out correctly due to the space I was working with. I emptied the water out of the tent and with some creative staking and the use of some rocks managed to prevent any more water from getting inside. Lesson learned. My down sleeping bag did manage to stay dry because it was on top of the sleeping pads as were some long underwear pants and a pair of wool socks. My sleeping bag is summer weight and usually is warm enough. This night was going to be questionable. The idea is I carry a down jacket so I can wear or layer it in when it gets cold and I can stick the foot of the sleeping bag into my backpack for extra insulation when needed. With a wet jacket and wet backpack that wasn't possible. Lesson learned. "By 5 p.m. it had stopped raining and I was crawling into my tent. I put my pack in one of the garbage bags and my wet clothing into the other garbage bag. I had plenty of room for all my gear inside my tarp tent since it is almost the size of a two-man tent. I even hung up my jackets hoping they might be partially dry by morning. I put my dry clothes on which got wet because I was wet. I kept my other wet undergarments on because the t-shirt was wool and the pullover was polyester and both would still provide warmth and probably dry out on my body by morning. My wool cap which was in my pack was surprisingly dry so I put it on and crawled into my sleeping bag which was now becoming wet. At this point a little shivering began because I was cooling down from my hike and the frantic effort to waterproof my tent. I managed to keep warm enough to nap for about an hour but was still chilled when I woke up. I had some food and water left over from my hike so I didn't try to cook up a hot meal for dinner or pump water since I didn't have anything to keep my warm outside the tent. As I hibernated in my tent I began to warm up and dry out. By the time I went to sleep I was warm except my feet. I figured they would eventually warm up. I was even offered a hot bottle of water but I declined. What can I say? I have paranoia of the bottle leaking in the bottom of my sleeping bag. My original thesis was proved correct later when I got up in the middle of the night to relieve myself and found my feet toasty warm. "By morning I was dry in my sleeping bag. My down jacket that I had hung up in the tent was dry enough to keep me warm while I enjoyed a hot breakfast and packed my gear. I hiked out in my long underpants and rain pants. It was overcast and cool. Thankfully so or I would have been hiking out in my long underwear. After climbing something like 60 SPS peaks over 15 summers this was the first trip I've actually gotten caught in a real sustained rainstorm. So I managed to survive and learn a few lessons only to be taken down by a stomach bug a week later but that's another story and maybe one not unrelated to the story of Red and White Mountain..."